BBC Radio 5 Live sports journalist and Worcester based author Chris Green will be signing copies of his new book Matchday: What Makes Saturday Special? at Kidderminster Harriers' home game against Hereford United this Saturday 29th October. 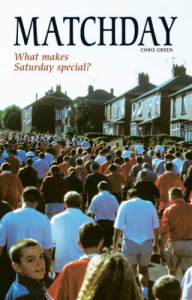 Matchday tells the unfolding drama of a typical football Saturday through the eyes of 18 people connected with the game, and the book features Harriers' award-winning caterer Brian Murdoch, who has served food at Aggborough for 43 years. Murdoch will receive a special presentation from the club at the game and is also being featured in the BBC food magazine, Olive. Recalling his day at Kidderminster, Green said: "Being with Brian at seven o'clock in the morning when the infamous soup starts bubbling and the cottage pies are going into the oven was amazing. It showed how much effort goes into his cooking". "Brian is different to most football club caterers. He actually serves a wider range of food to away fans because they have travelled further and spend more money. On the day of my visit one fan drank eight cups of soup and took another three home! Brian is the only football caterer I know who sells food like pasta and curries to fans on the terraces. He is a truly remarkable person". Copies of Matchday will be on sale at the Harriers club shop. Chris will be available to sign copies from 2pm onwards and immediately after the match. "Simply brilliant...possibly the best book ever written about the heart and soul of British football"
"The concept of this book is intriguing ... a dynamic read." "inspiring ... laudable, timely, exploring the mysterious heart of the game more effectively that any number of Super Sundays." "a wonderful portrait of modern British obsession"
"An uplifting read which looks into the soul of football (yes, there is one) and leaves your eagerly looking forward for more.....If those who run the game really want to find out the reasons for the current decline they could do much worse than read Matchday"
"While it's an exaggeration to say that English football is facing a crisis, the top level certainly needs to deal with a number of major issues. By aiming his sights mainly below the Premiership, 'Matchday' is a timely restoration of faith"
"Football's version of TV's Twenty Four..."